Judge Thomas Moukawsher reading his decision. In a broad indictment of how Connecticut supports its poorest schools, Superior Court Judge Thomas Moukawsher ruled Wednesday that the state’s method for distributing education aid is irrational and unconstitutional, while declining to second-guess the General Assembly on the ultimate level of state spending. Moukawsher said the plaintiffs failed to meet their high burden of proving beyond a reasonable doubt that the quality of public education violates the state Constitution by the standards of minimum funding or the adequacy of instruction in the state’s classrooms. But he gave them a victory on the question of how aid is distributed, special education is funded and the standards to which students and teachers are held. He handed the state, the plaintiffs and General Assembly an ambitious five-point outline for action on revamping how teachers are evaluated and paid, special education students are evaluated and served, and more broadly, how the state directs $2 billion in annual state spending for local education, plus another $1 billion in reimbursements for school construction and renovations. The judge gave the state 180 days to propose remedies to his long list of failings, starting with how it intends to distribute state aid. He said legislators circumvent the existing Education Cost Sharing formula, often at the expense of school systems in most desperate need of resources. He said the method must be rational, equitable and verifiable. Herbert C. Rosenthal, president of the coalition that brought the suit, called the decision “a landmark victory” for public school students. Still, the judge’s refusal to order increased funding could mean that elements of the coalition – an unusual group that included labor and management, small towns and big cities – will end up fighting over how the legislature should reapportion state aid. “Unfortunately, the court declined to provide any remedy for the disparity in resources and revenue for students in the state’s poorest communities – the essence and heart of the CCJEF litigation,” said Sheila Cohen, the president of the largest teachers’ union, the Connecticut Education Association. 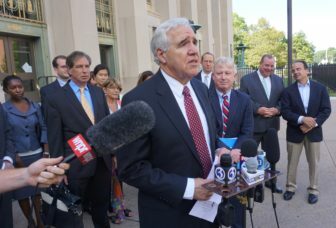 A spokesman for the office of Attorney General George Jepsen said it was reviewing the decision and would have no comment on whether it would seek an interlocutory appeal to the state Supreme Court. Over nearly three hours, Moukawsher read from the bench a carefully calibrated decision that made clear the limits of judicial intervention, while scolding the legislature for recently stripping $5 million in aid from some of the neediest school systems and giving it to comparatively wealthy communities. “In desperate times, $5 million is a lot of money,” he said. He took to the bench at 11 a.m., called a recess at 1 p.m., and returned to the bench at 2 p.m. for nearly another hour to resume reading a 90-page decision likely to make education a major issue in the 2017 and 2018 legislative sessions, when lawmakers also are expected to struggle to balance the budget. House Minority Leader Themis Klarides, R-Derby, warned against a legislative resolution in 2017. Rosenthal said he did not see how Gov. Dannel P. Malloy and the legislature would address the judge’s myriad concerns without additional funding, despite Moukawsher’s pointedly saying the court had no authority to set funding levels. Associate Attorney General Joseph Rubin, center, and Joseph Moodhe, lead counsel for the plaintiffs, as Moukawsher read his decision. The judge questioned the wisdom of the state’s annual spending of about $1 billion on school construction and renovation – while direct aid to operate the schools is just $2 billion. He also indicted schools that graduate students who do not meet minimal standards. “These aren’t isolated stories,” he said. He set off a minor stir in the audience when he said teacher salaries need to be linked to skills and pronounced current evaluations of teachers as a near-worthless exercise that judges 98 percent of teachers as competent. A smiling Danbury Mayor Mark Boughton, a Republican, turned and made eye contact with a Democratic colleague, Waterbury Mayor Neil O’Leary. “I think it is a game-changer in that it recognizes the inadequacies of the system, the clear-cut failure of that system,” Ganim said. One of the teachers’ unions that are members of the coalition objected to the judge’s finding that teacher evaluations in Connecticut have little value and that salaries are too closely tied to seniority, not performance or specialty. The CEA indicated it would work to improve teacher evaluations, but did not address Moukawsher’s criticisms in depth. The ruling by Moukawsher came 11 years after a coalition of parents, students, teachers and municipal officials sued the state and just a month after final arguments in a months-long trial not far from the State Capitol, examining, among other things, the adequacy, fairness and rationality of how local schools are funded. Malloy supported the litigation while mayor of Stamford. The suit was initiated on behalf of the coalition by the Education Adequacy Project Clinic at Yale Law School, then taken over on a pro bono basis by Debevoise & Plimpton, a New York law firm. Joseph Moodhe and Bridgeport Mayor Joseph P. Ganim. 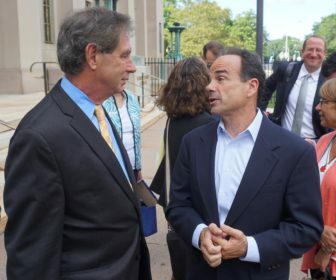 The lawsuit, formally the Connecticut Coalition for Justice in Education Funding vs. Gov. M. Jodi Rell, is the latest in a series of legal and political battles to define the state’s constitutional obligation to fund local schools and to prod the General Assembly to offer a more rational and expansive system of financial relief to municipalities dependent on property taxes. In 2010, the Connecticut Supreme Court concluded in response to the coalition’s lawsuit that Article Eighth implied a qualitative standard of a minimally adequate education, and that the state is responsible for ensuring that level of adequacy is met. It was left to Moukawsher, a former one-term Democratic legislator named to the bench by Malloy in 2013, to both define the standard and determine if the state was meeting it. The state currently provides about $2 billion annually in school aid through its Education Cost Sharing formula. Moukawsher ordered the state to begin work on a new funding formula, while not mandating increased overall spending. In doing so, he gave deference to the state’s position. If remedies in an education case are constitutionally required, the Supreme Court has left no doubt “our courts should and will defer to the legislature, in the first instance, to provide those remedies,” wrote the state, whose legal team was led by Associate Attorney General Joseph Rubin. The decision came as the state struggles with chronic fiscal challenges. The legislature’s nonpartisan Office of Fiscal Analysis is projecting a $1.3 billion deficit built into 2017-18 state finances, a gap of about 7 percent. And unless adjustments are made, it is expected to top $1.4 billion in 2018-19 and $1.5 billion the following year. Further complicating matters, the Malloy administration reported in late June that it had downgraded expected income tax receipts for the outgoing fiscal year by $75 million, and sales tax revenues by $28 million. 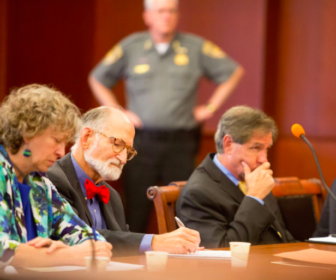 During final arguments last month, Moukawsher pointed to a list showing the distribution of Education Cost Sharing grants and questioned whether the state had a rational approach to distributing education aid, regardless of what it ultimately can afford. Rubin said he did not know why the legislature funneled money where it did, but the vast majority of the over $2 billion in state education aid not tied to retirement benefits goes to high-poverty school districts. The lawsuit focused on educational deficiencies in six districts that the plaintiffs said were representative of high-need schools: Bridgeport, East Hartford, Danbury, New Britain, New London and Windham. 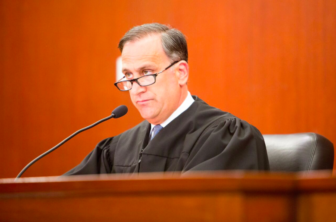 The state argued that the judge should not infer there is a systemic problem even if he determined the plaintiffs proved that the state is not fulfilling its obligation in those six school districts. But the landmark Horton vs. Meskill decision in 1977 that ordered the state to overhaul how it funded schools was brought by a lone plaintiff who was an elementary student in Canton. On Wednesday, the judge looked far beyond the six districts, reciting the poor test scores from many of the 30 poorest school systems. He disabused anyone who suggests the achievement gap in Connecticut is simply the product of high achievement by the top-performing schools in comparison to the worst: The state’s poorest schools are posting results worse than the poorest schools of 40 other states and is no better than the other nine. “Nobody did worse,” he said.